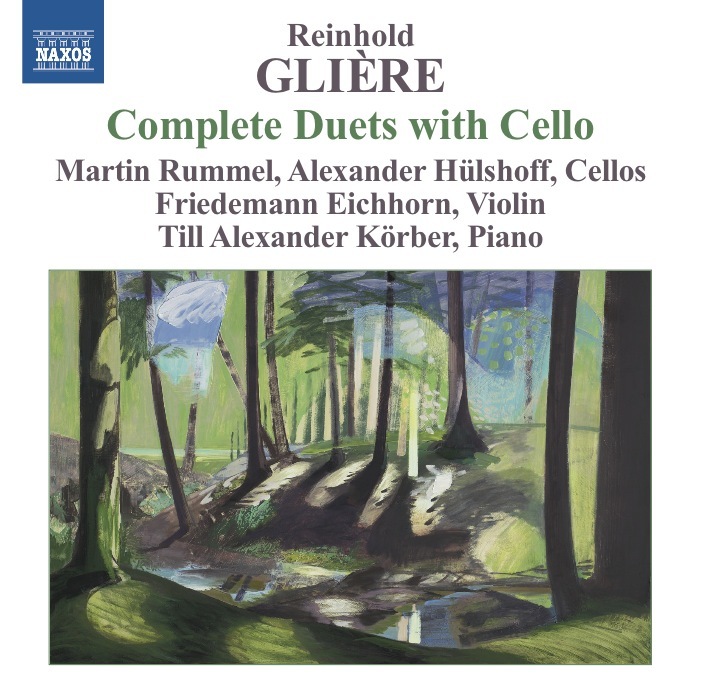 In 2010 I suggested to record the violin/cello and cello/cello duets by Reinhold Glière to Klaus Heymann, owner of Naxos. He immediately agreed and the details were literally finalized within 24 hours. Friedemann Eichhorn and Alexander Hülshoff have a number of highly successful recordings on Naxos, so asking them seemed only logic. Alexander and I have been friends for many years, and Friedemann was at the time to be the violinist for the Mozart/Hummel Symphonies recording. After timing those two duo cycles, I found out that they were too short for a disc and suggested to include works for cello and piano as well which makes this recording the first complete of Glière's duos with a cello. Reinhold Glière's masterpieces for violin and cello, two cellos and cello and piano were a huge delight to rehearse and record. I think that these pieces are astonishingly original and deserve a place in every cellist's repertoire. A special twist is - yet again - the cover painting: When doing my research for the liner notes of the recording, I found out that one of the descendants of the Glière/Glier family (Glière's father was a brass instrument maker from Klingenthal, the French version of the family name is Reinhold Glière's invention) was the painter Mike Glier (www.mikeglier.net), so I contacted him and asked him if he would be able to provide a painting to be printed on the cover. He listened to the recording and sent me a few scans of his paintings that he thought were appropriate, one of which is now depicted on the CD cover.